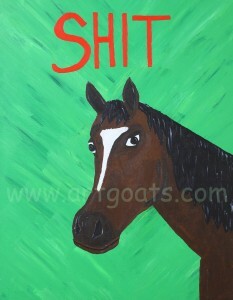 A portrait of a horse as a young man openly expressing himself. Featured in the Regretsy book and on www.regretsy.com. 8″x10″ & 4″x5″ prints available. This is a inkjet archival print on 230g matte paper created from original acrylic painting. White border for easy framing. Prints, Posters, and Postcards are available at Art Goats on etsy. All prints are signed, numbered and come in a nice protective sheath and cardboard backing to keep straight. 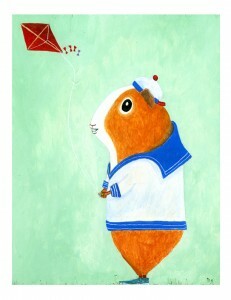 A portrait of a guinea pig flying a kite in his favorite Sunday sailor suit. Inspired by an illustration I came across a few years ago from a mysterious unknown artist. This is a inkjet archival print on 230g matte paper created from original acrylic and ink painting. White border for easy framing. Bonjour Monsieur! Je suis bon dans la cuisine! 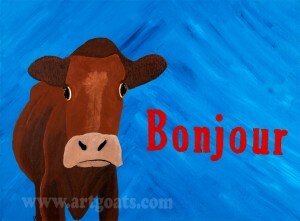 A portrait of a French Cow. A rare glimpse of the Giant Squid floating about in the deep seas of the Pacific. 5″x7″ Print. 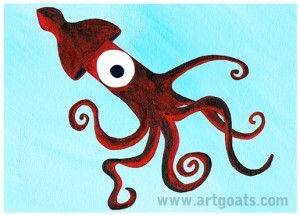 This is an inkjet archival print on 230g matte paper of an original acrylic painting. Just boosting my hipster street cred! 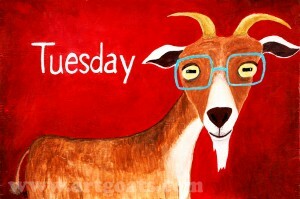 A portrait of a hipster goat showboating his ironic, over-sized glasses while posing in front of a Tuesday billboard. 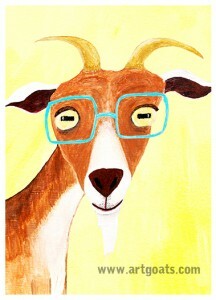 Just trying to boost his hipster cred. 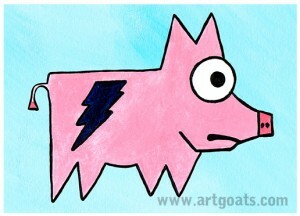 The pig with lightning bolt tattoo. 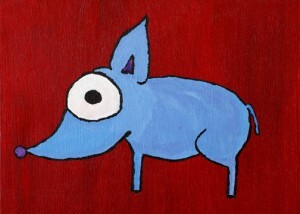 This is the third addition to my pig with lightning bolt series. 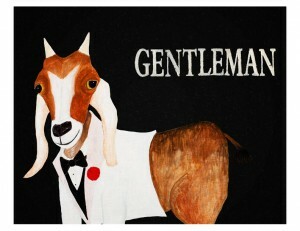 A portrait of a modern gentleman goat wearing his finest and shiniest white tuxedo. Ready to hit the scene. Maker’s on the rocks is his drink. 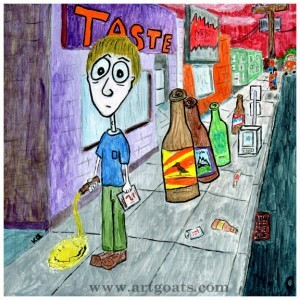 Chasing the night in the streets of Southeast Portland sometimes leads to being stalked by giant zombie beer bottles. When you are done with the bars that Capture By Porches Invasive Species IPA will tempt you for once last taste. A portrait of a classic bathroom in a Victorian House I used to rent. Had a nice cool blue theme. 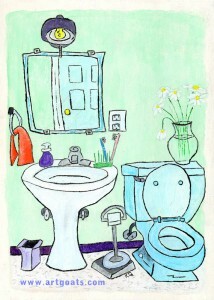 This little print will really tie your bathroom together. Just in time for Mother’s Day. This is a inkjet archival print on 230g matte paper created from original acrylic and ink painting on wood. This is Eggs. This little guy is kind of a big deal around town. When he isn’t rallying around local dog parks and enjoying tropical sippers on sunny days he is usually kicking back on the couch eating dry roasts and posing for portraits. If you don’t have a pug or a bat-pig-monkey thing of your own to make you laugh and cheer you up at the end of the day this portrait of Eggs surely will. 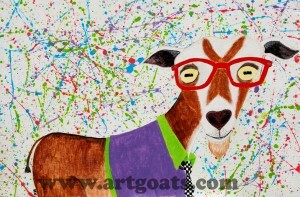 A portrait of a hipster goat hitting the scene in his 80’s fashion gear while posing in front of a Jackson Pollack painting. Skyrocketing his hipster cred. 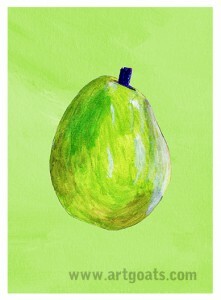 This is an inkjet archival print on 230g matte paper of an original acrylic painting. White border for easy framing. 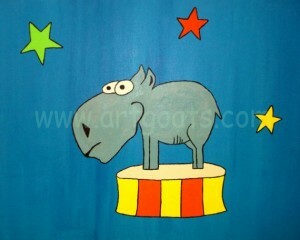 A hornless Rhino is definitely an oddity out in nature here he is on display for all of the world to see. A kid favorite. Check him out. 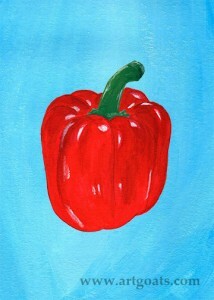 8″x10″ digital print created from original acrylic painting. 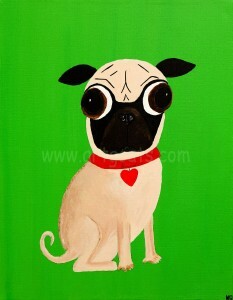 A Portrait of a pedigree Chihuahua. 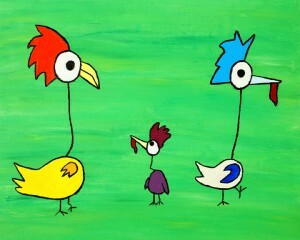 A young buck chicken seeking existential truths from his mom while his father is dancing. 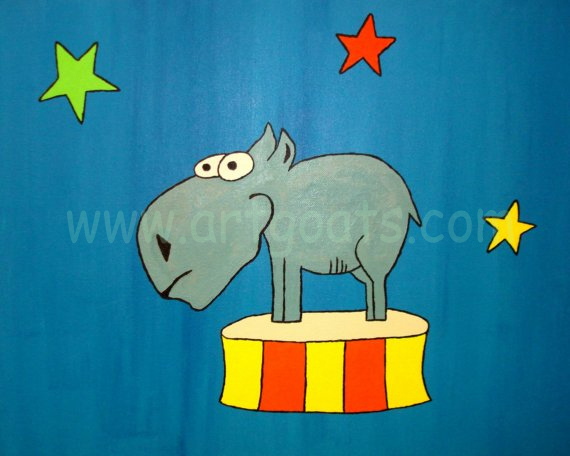 8″x10″ digital print of original acrylic painting. 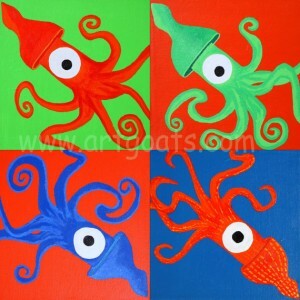 A rare glimpse of a posse of elusive Giant Squids floating about in the dark deep seas of the Pacific. 8″x8″ Original Print.